Palestinian president Mahmoud Abbas chairs a meeting of the Palestine Liberation Organization Executive Committee at the Palestinian Authority headquarters in the West Bank city of Ramallah on Feb. 3, 2018. The United States says the offices of the General Delegation of the Palestine Liberation Organization (PLO) in Washington should close. The U.S. State Department said on Monday that the PLO has not taken steps to support the start of direct and meaningful negotiations with Israel. The Associated Press reports that a requirement in U.S. law states that the PLO mission must close if the peace process does not move forward. President Donald Trump has shown strong support for Israel and criticized Palestinian leaders for not doing enough to work toward a peace deal. The Trump administration said that the PLO has not worked with the U.S. government in peace efforts. The group has also condemned an American peace plan that has yet to be released. The State Department added that the decision to close the PLO offices is consistent with concerns within the administration and in the U.S. Congress. Issues of concern include Palestinian attempts to get the International Criminal Court (ICC) to take legal action against Israel. 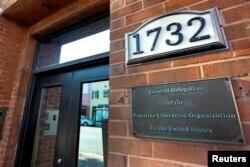 The ICC was established in 2002. The court’s aim is to bring to justice individuals accused of war crimes, crimes against humanity and genocide. 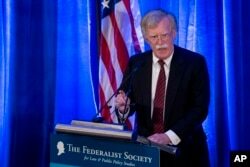 President Trump’s national security advisor, John Bolton, spoke about the ICC during his visit Monday to the Federalist Society research group, in Washington. Bolton noted that the U.S. government never signed the treaty creating the court and does not recognize it. He also said the U.S. would consider restrictions against ICC lawyers or officials involved in efforts to investigate Americans. The U.S. government has traditionally positioned itself as a neutral party in the conflict between Israel and the Palestinians. The statements by the State Department and Bolton come as the U.S. government has increased pressure on the Palestinians to get involved in peace efforts. 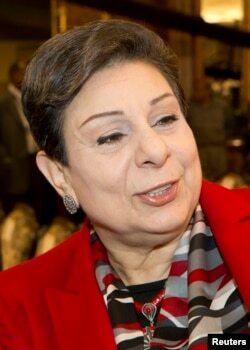 PLO official Hanan Ashrawi is pictured in this file photograph. This month, the United States announced it was stopping payments to the U.N. agency that helps Palestinian refugees. The U.S. government supplies nearly 30 percent of the budget for the U.N. Relief and Works Agency. In addition to UN aid, the government cancelled another $200 million in direct aid to Palestinians last month.